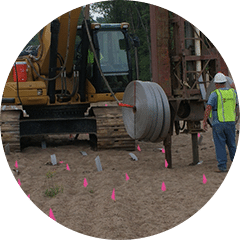 Subsurface Constructors is one of the nation’s leading ground improvement contractors, with experience completing ground improvement projects from coast to coast. 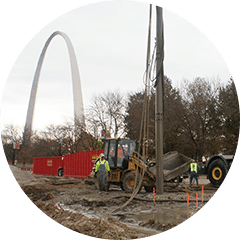 In addition, we have a large fleet of geotechnical construction equipment, including restricted-access and high-torque capability drill rigs and some of the most advanced ground improvement rigs in the U.S. 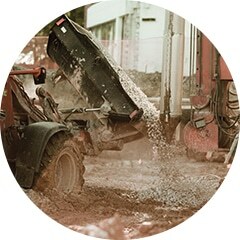 Ground improvement is the use of mechanical means to improve weak or marginal soils and fills to support a structure. The phrase ground improvement encompasses many different techniques. However, the most prevalent type in the U.S. is aggregate pier/stone column ground improvement. These techniques are primarily used to improve bearing capacity and settlement performance of a building site, and for liquefaction mitigation. Our experienced engineers design and construct cost-competitive ground improvement plans that closely fit your project requirements. We select the best solutions from our robust offering of ground improvement services, listed below. With this highly effective, cost-efficient method, we increase bearing capacity while minimizing spoils and reducing the risk of foundation settlement. Vibro concrete columns are grouted columns installed using vibratory probes in soils such as organic silts and peats that are too weak to support the installation of stone columns/aggregate piers. Vibrocompaction is a ground improvement technique that uses large vibratory probes to compact loose sands for increased bearing pressure, or in most cases, to mitigate the risk of seismic liquefaction. We install wick drains in soft soils to provide additional porewater drainage paths that help consolidate the soil. This method is highly useful for projects that require an earthen embankment approach to an MSE wall abutment or other large areas of soft, cohesive soils.